Three trips to Margate in a month and now Pushing Print is over. It was a good show, lots of interesting work and getting to meet other artists was lovely. I also got some good entomology suggestions too, so the beetle project is developing. Unfortunately the Zoology Museum in Cambridge is closed for renovations, however, I was kindly allowed a morning’s access to a few beetles last week. Can you imagine the work it is going to involve packing up all those insects, birds and shells, etc? It is such an amazing experience going into these more scientific/academic ‘zones’, which are obviously so different from the messy, yet controlled hubbub of a print room. I was given a desk in a quiet corner with a magnifiying table light and I sat quietly drawing all morning. 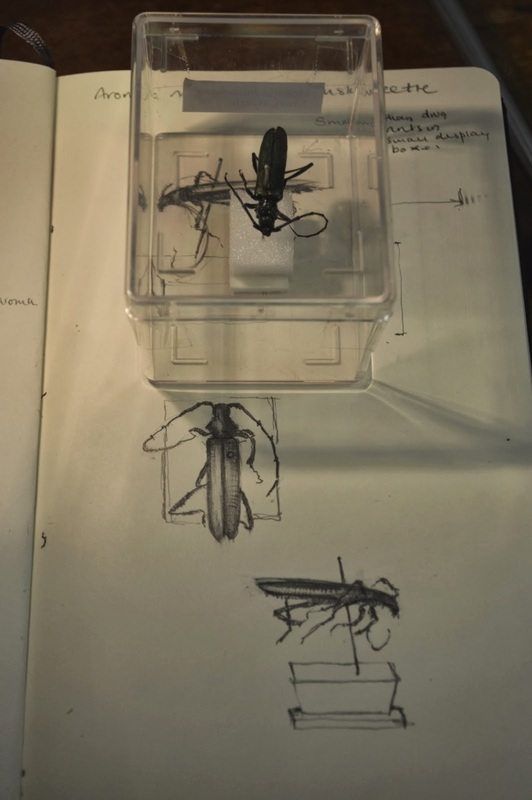 I am intrigued by all the entomological equipment, the perspex boxes, the pins, the little platforms of styrofoam, where cork or something similar was used before… (note to self – check this out!). 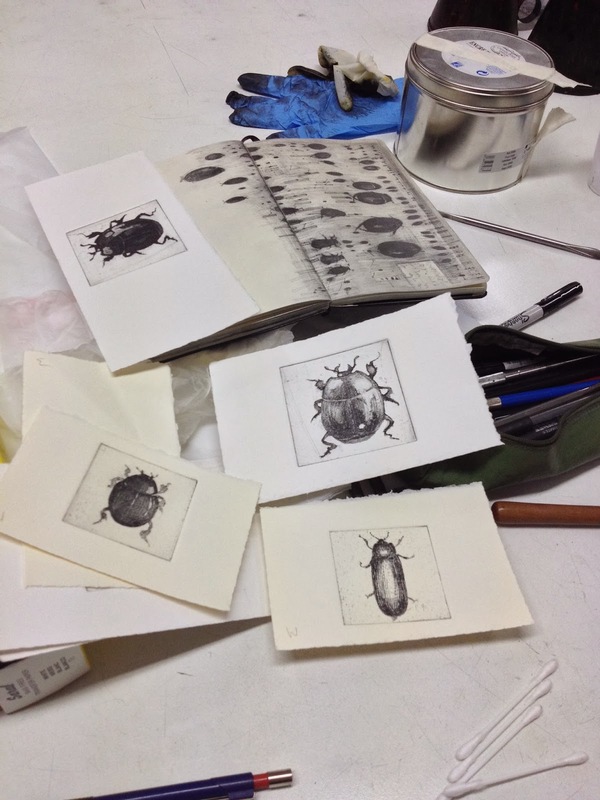 I have produced so far a few beetle etchings. I am trying out different methods, hard ground, soft ground and sugar lift aquatint to see what I think works the best. Here are a few to begin with. 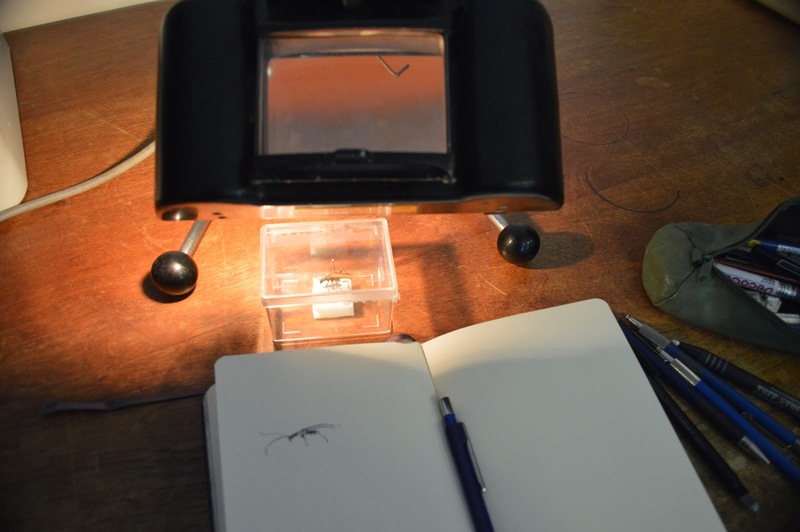 An assortment of beetle etchings in progress and sketch of Darwin’s Beetle box. 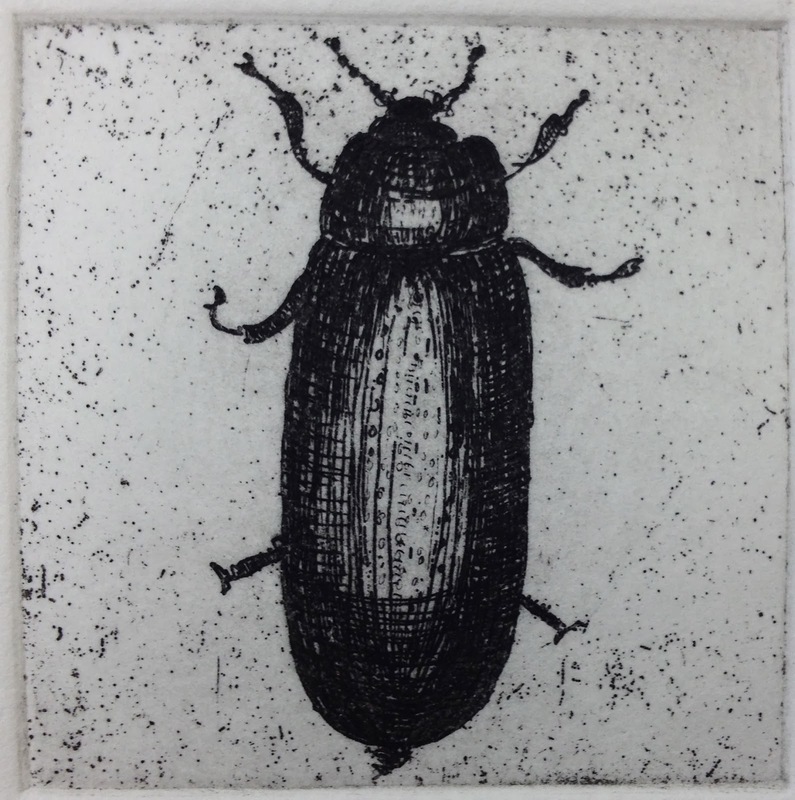 Hister Beetle – Sugar lift Aquatint, hard ground and burnishing. 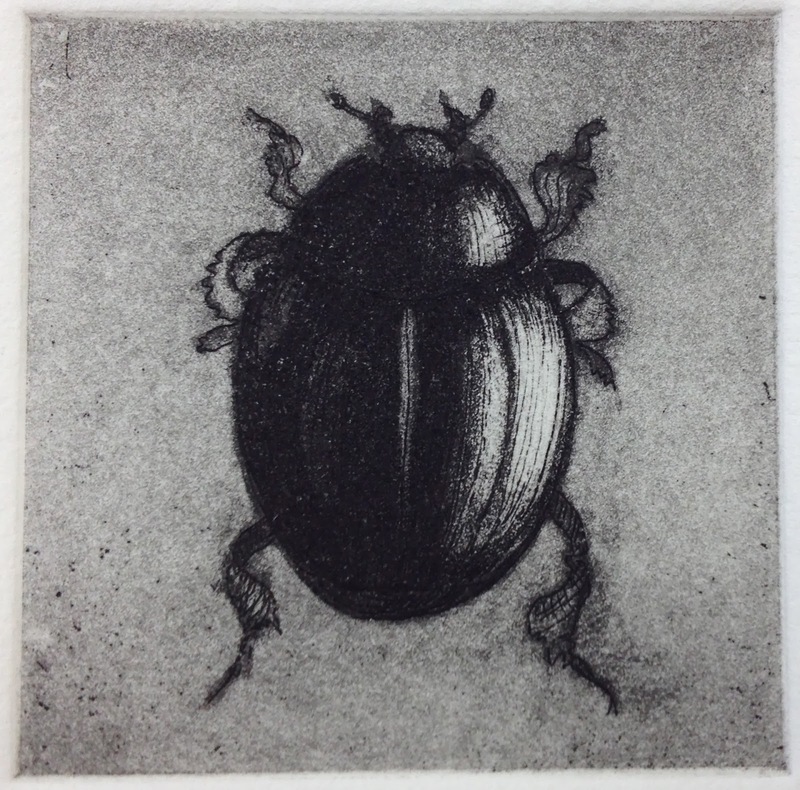 Rhinoceros beetle – Hard ground etching. 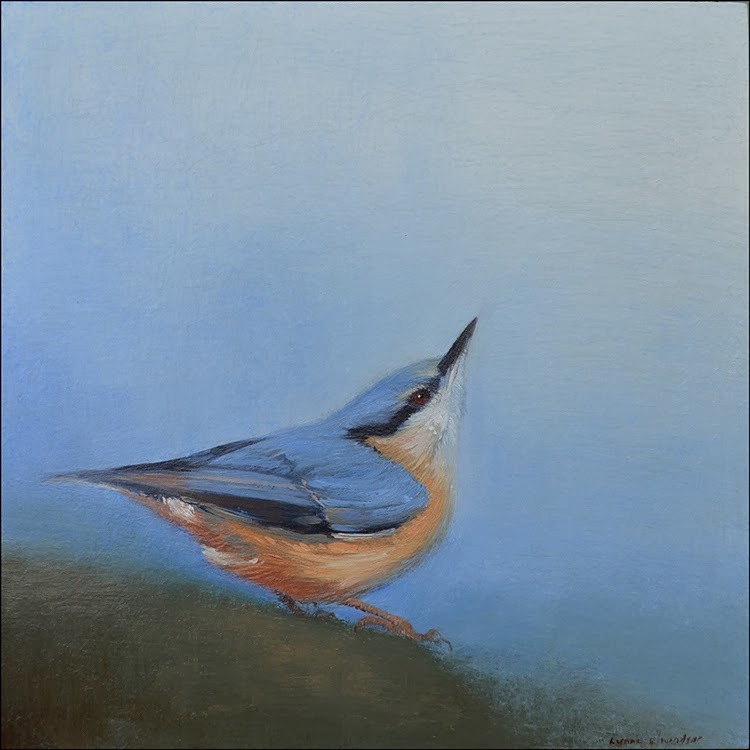 In addition, I have just finished a Nuthatch painting. Now to finish my tax return…. that’s no fun at all!